A series of fossil discoveries have revealed giant dinosaurs that, head to tail, extended a third of a football field and weighed as much as a dozen elephants or the largest humpback whale. 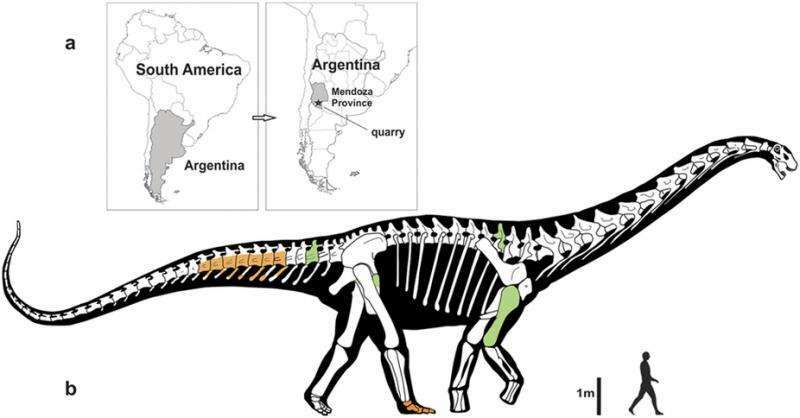 And a Pittsburgh paleontologist was on one team to study newly discovered fossils of two such titanosaurs - gigantic creatures that likely shook the ground with each step in what is now modern-day Argentina. Those behemoths were 82 to 92 feet and up to 66 tons - 132,000 pounds. "You'd definitely feel vibrations when lots of them were moving, just like a herd of buffalo shakes the ground," said Matthew Lamanna, assistant curator of vertebrate paleontology at Carnegie Museum of Natural History. "But they definitely walked rather than ran. I don't think titanosaurs could move very quickly." The dinosaurs known as Notocolossus gonzalezparejasi roamed the outskirts of Patagonia during the Cretaceous Period about 86 million years ago. Their necks were long enough to eat from the ground to the tree tops, with similarly long tails other creatures likely strived to stay clear of. Lamanna, who holds a Ph.D. in paleontology, worked on the team led by Bernardo Gonzalez Riga of the National University of Cuyo in the Mendoza Province of Argentina, who first spotted a fossil partially sticking up from rocks nearly a decade ago in a desert full of fossils of the world's largest dinosaurs. Details about the fossil discoveries were published Monday in the journal Scientific Reports. Despite their huge dimensions, Notocolossus dinosaurs would seem like Danny DeVitos standing beside Arnold Schwarzenegger when compared with the largest titanosaur also recently discovered. It is still without a name and details on this latter species have yet to be published. But that titanosaur found in the Patagonia region of Argentina will be the focus of the Nature television documentary "Raising the Dinosaur Giant." For now, it represents the largest known creature to walk on Earth at 122 feet long with a couch-sized thigh bone notably longer than host Sir David Attenborough, according to a PBS photograph of him reclined beside it. That dinosaur existed about 100 million years ago and would stretch from the goal line to beyond the 40 yard line on a football field. "They almost certainly are different species since that dinosaur is at least 10 million years older (than Notocolossus) and comes from different rocks," said Lamanna, who also helped a Drexel University team dig up and study the fossils of the giant titanosaur Dreadnoughtus schrani announced in September 2014. The Dreadnought fossils are more complete than those of Notocolossus. But Dreadnoughtus was similar in size at up to 65 tons and 85 feet long, despite not being fully mature. "People might be suffering from giant titanosaur fatigue by now," Lamanna said, given the string of fossil finds. "But one of the cool things is that there was not one but many species of giant titanosaurs and most of them come from Argentina." Lamanna, with a research focus on Southern Hemisphere dinosaurs, said Gonzalez Riga summoned him about six years ago to help analyze the fossils he discovered roughly a quarter mile apart in the same rock layer. The two dinosaur specimens had identical tail bones revealing the same species. Fossil also include back, forelimb and pelvis bones, with a complete ankle and foot from the smaller specimen. That find helps explain how the tree-trunk-like ankles and feet, containing few bones and tiny toes, evolved to support such massive weight. Elephants also have small toes but many foot bones, revealing two evolutionary paths in foot development for Earth's largest animals, Lamanna said. Gonzalez Riga said titanosaurs were the heaviest terrestrial creatures that ever lived. "But the hind feet of these dinosaurs - which are critical for understanding how they stood and moved - were not completely known until now," he said. "Now we have new evidence that helps to solve this mystery." Titanosaur bones, especially their vertebrae, were infused with air, making them lightweight but strong. The dinosaurs also lived during one of the hottest periods in the past 600 million years, fostering the growth of lush foliage almost from pole to pole. Titanosaurs had communal nesting areas and fossilized footprints reveal they moved in herds. One theory holds that, similar to an arms race, plant-eating dinosaurs needed to grow ever larger to thwart attacks from ever larger predatory dinosaurs. "I think it's safe to say we haven't found the biggest dinosaur yet," Lamanna said. Stay tuned. Gonzalez Riga has a lab full of titanosaur fossils he's collected. "Hopefully, with this wealth of new and exciting fossils to study, we'll finally be able to understand more about giant titanosaurs, the biggest creatures that ever lived on land," Lamanna said. The go to site for this is "Sauropod Vertebra Picture of the Week". "Notocolossus is a beast ... Well, it wasn't the world's largest sauropod. And to their credit, no-one on the team that described it has made any such superlative claims for the animal. Instead they describe it as, "one of the largest terrestrial vertebrates ever discovered", and that's perfectly accurate." Then follows a review of physiology and its use for diverse estimates of sizes/masses - given in several lists - as well as phylogenetics of all of the listed beasts. "The discrepancies in mass estimation produced by the Campione and Evans and Bates et al. methods indicate a need to compare the predictions of these methods across a broad range of terrestrial tetrapod taxa. Nevertheless, even if the body mass of the Notocolossus holotype was closer to 40 than 60 metric tons, this, coupled with the linear dimensions of its skeletal elements, would still suggest that it represents one of the largest land animals yet discovered." "No, David Attenborough, you can't tell how heavy a dinosaur was from the circumference of its femur" ... as Anderson et al. and other authors have made clear, the error-bars on this method are substantial. ... In other words you could have two animals with equally robust femora, one of them nearly 60% heavier than the other, and they would both fall within the 95% confidence interval."